By LUDWIG VON KOOPA - There's no longer a point in having Miis on the Nintendo Switch. Just as the Wii era of Nintendo is ending (Wii + Wii U), and the Mii player avatars with it, the Nintendo Switch introduces additional Mii customisation options, including hair colour. Disreputable source Eurogamer has dedicated a whole (short) article to the fact that you can now give blue (and every other colour) hair to Miis in the Nintendo Switch's Mii Maker. That's a new feature! Reminder that Mii creation is now optional on the Nintendo Switch, and with Miiverse not returning, this makes Miis close-to-useless. They can still be used as an option to represent your profile image on your Switch (along with a set amount of pictures of a few first party Nintendo characters, including King Bowser), and also on games that include Miis, like Mario Kart 8 Deluxe likely will. A Super Smash Bros. on the Nintendo Switch won't just cut Miis out, so Mark Block can still be in games. That's about it. With blue hair options, one no longer has to make disastrous attempts at Ludwig Von Koopa Mii creation that end up resembling Guzma. But... now, one no longer has any reason to attempt to make a Ludwig Von Koopa Mii — disastrous or otherwise. Wanna see what Ludwig looks like? Here he is in Mii form—it's your boy Guzma! Fortunately, there are a lot of upsides to Miis being dramatically reduced in importance. And third, reviewers will stop suggesting Mii integration in games where Miis do not belong, like Fire Emblem: Radiant Dawn. Those are all fantastic side-effects of having Miis greatly diminished in importance. Meanwhile, Miis don't have an upside besides for the aforementioned Mark Block Mii, and possible other specific instances like having a Ulysses S. Grant Mii in the Black Knight costume for Super Smash Bros. For Wii U to fulfill another KoopaTV article's premise comparing Civil War generals with Fire Emblem: Path of Radiance. Other than those rare instances, I've never actually used Miis in a game over real characters. Why pick them in Mario Kart 8 when I'm in Mario Kart 8? StreetPass Mii Plaza is full of Miis, but more often than not I just hire superficially diverse cats for Market Crashers. Even in this brief time period before I unlocked Ludwig Von Koopa in Mario Kart 8, I didn't play as this punk Mii. I hope this now means the Nintendo Switch will SWITCH to Nintendo focusing on characters once again. If anyone can think of why they are even bothered making new Mii customisation options, let me know. 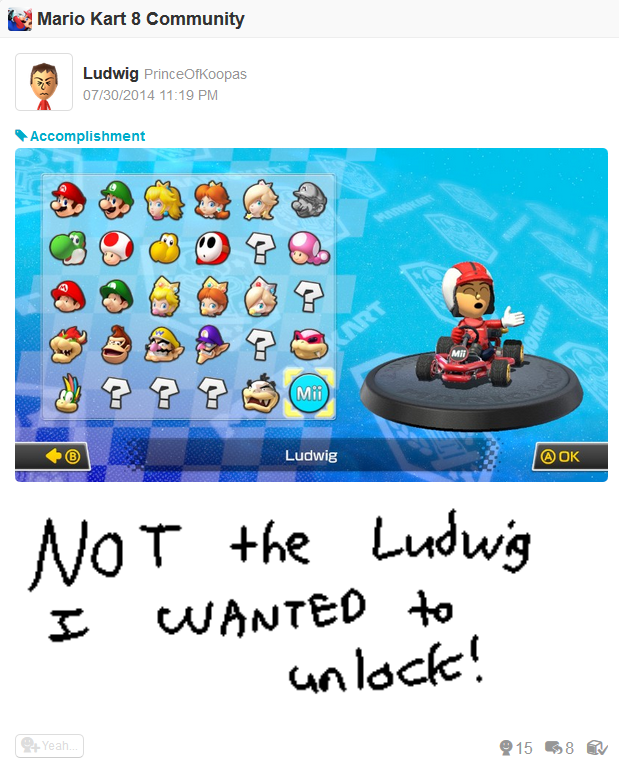 Ludwig will continue to linger on Miiverse for as long as it exists (or until he's permanently banned) at NNID PrinceOfKoopas. You should Follow him. He's recently registered his Nintendo Account ID, which is princeofkoopas. That Nintendo Account is represented by his pre-second-ban Mii for some reason, because it never bothered to update. Miitomo not only looks stupid and silly, but it's ending a year later. Rawk obviously didn't listen to Ludwig when he said it was too late and totally pointless for the Switch's expanded Mii customisation. The Miis could be used in the future Animal Crossing game, but other than that they're not needed any longer. Or... just have even more extensive in-game customisation. I think Miis are here to stay, if only to keep the engagement of the players. Other than that, Miis are as dead as the Wii U's planned Dual Gamepad functionality. Xenoblade Chronicles X had character customization (and even Animal Crossing, to an extent), but the Miis were never used. Miis in Xenoblade Chronicles X sounds like a totally laughable disaster.